Summary: Eric Muller has been trying to hack the girlfriend problem for half his life. As a teenage geek, he discovered his gift for programming computers-but his attempts to understand women only confirm that he's better at writing code than connecting with human beings. Brilliant, neurotic, and lonely, Eric spends high school in the solitary glow of a screen. I don't know if you remember, but Kathy (aka Bermuda Onion) and I hosted the Reagan Arthur Book Challenge. I have read quite a few of the books, but I was far from reading all of them. I decided it was about time for me to pick up another one. 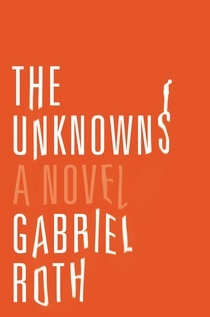 I selected THE UNKNOWNS by Gabriel Roth because it was getting some terrific reviews. It also didn't hurt that it was relatively short and I haven't had much time to read lately! THE UNKNOWNS is the story of Eric Miller, a man who has made a lot of money in Silicon Valley. He has never had much luck with women, and that started in high school when he was more into figuring out computers than girls. He was admittedly a geek and he decided to use his technical skills to understand girls -- he collected data on them! Needless to say, that didn't work so well for him; and his trouble with women extended into his adult life. However, Eric struck it rich in his early 20s and has now found that certain women are attracted to him. He plays "the game" and gets some girls, but he has yet to discover true love. That is until he meets Maya! Eric and Maya hit it off and things are going well until Eric learns about Maya's issues from her past. He becomes almost obsessed with understand everything about Maya and fixing her problems, and it very well might jeopardize his first attempt at a real relationship. THE UNKNOWNS was absolutely delightful. In fact, I was surprised to learn that this was Mr. Roth's debut novel. I loved the character he created in Eric, and I also appreciated both the humor and social commentary in the novel. And as strange as it sounds, I found myself falling for Eric despite (or perhaps because of) his social mishaps. The novel went back and forth between Eric's adult narrative and his teenage one. I loved getting to see Eric as a child and then seeing how much he changed (do I daresay evolved?) as an adult. I was impressed with how well Mr. Roth developed both of Eric's voices, and I was equally entertained by both nerdy "Erics." Furthermore, I loved the humor and general tone of the story. Eric is portrayed as someone who is more comfortable around machines than people. His attempts to fit in are sweet and I did feel a little concerned for him on occasion; however, I also found myself laughing like crazy at the things he did. Whether it was what he said, how he said it, or even his insight into human nature, I thought he was extremely funny and occasionally spot-on. THE UNKNOWNS was also a touching story, and in many ways, a coming-of-age story for Eric. Through his relationship with Maya (as well as his missteps with her), Eric learned some valuable lessons about himself and his role in a romantic relationship. Highly recommended. I didn't read this one during the challenge either. How did we both miss it? It sounds terrific!